Naguib Mahfouz (Arabic: نجيب محفوظ, Nagīb Maḥfūẓ) (December 11, 1911 – August 30, 2006) was an Egyptian novelist who won the 1988 Nobel Prize for Literature. He is regarded as one of the first contemporary writers of Arabic literature, along with Tawfiq el-Hakim, to explore themes of existentialism. Mahfouz's importance extends beyond his considerable artistic skills. He was an advocate for Salman Rushdie after Ayatollah Khomeini placed a fatwa on his life for the publication of The Satanic Verses about the Prophet Muhammad, at great personal risk. He received death threats for his criticism of the fatwa. Mahfouz was well read in Western literature and embraced the ideals of socialism. He serves as a bridge between Western culture and democracy and the world of Islam. Born into a lower middle-class Muslim family in the Gamaleyya quarter of Cairo, Mahfouz was named after Professor Naguib Pasha Mahfouz (1882-1974), the renowned Coptic physician who delivered him. Mahfouz was the seventh and the youngest child in a family that had five boys and two girls. The family lived in two popular districts of the town, in el-Gamaleyya, from where they moved in 1924 to el-Abbaseyya, then a new Cairo suburb; both provided the backdrop for many of Mahfouz's writings. His father, whom Mahfouz described as having been "old-fashioned," was a civil servant, and Mahfouz eventually followed in his footsteps. In his childhood Mahfouz read extensively. His mother often took him to museums and Egyptian history later became a major theme in many of his books. The Mahfouz family were devout Muslims and Mahfouz had a strictly Islamic upbringing. In a future interview, he painfully elaborated on the stern religious climate at home during his childhood years. He stated that "You would never have thought that an artist would emerge from that family." The Egyptian Revolution of 1919 had a strong effect on Mahfouz, although he was at the time only seven years old. From the window he often saw British soldiers firing at the demonstrators, men and women. "You could say," he later noted, "that the one thing which most shook the security of my childhood was the 1919 revolution." After completing his secondary education, Mahfouz entered the King Fouad I University, now known as the University of Cairo, where he studied philosophy, graduating in 1934. By 1936, having spent a year working on an M.A., he decided to become a professional writer. Mahfouz then worked as a journalist at er-Risala, and contributed to el-Hilal and el-Ahram. The major Egyptian influence on Mahfouz's interest in science and socialism in the 1930s was Salama Moussa, the Fabian intellectual. A longtime civil servant, Mahfouz served in the Ministry of Mortmain Endowments, then as Director of Censorship in the Bureau of Art, Director of the Foundation for the Support of the Cinema, and finally as a consultant to the Ministry of Culture. He published 34 novels, over 350 short stories, dozens of movie scripts and five plays over a 70 year career. Many of his works have been made into Arabic-language films. Mahfouz left his post as the Director of Censorship and was appointed Director of the Foundation for the Support of the Cinema. He was a contributing editor for the leading newspaper el-Ahram and in 1969 he became a consultant to the Ministry of Culture, retiring in 1972. He was a board member of Dar el-Ma'aref publishing house. Many of his novels were serialized in el-Ahram, and his writings also appeared in his weekly column, "Point of View." Before the Nobel Prize only a few of his novels had appeared in the West. Mahfouz remained a bachelor until the age of 43. The reason for his late marriage was that Mahfouz labored under the conviction that marriage with its numerous restrictions and limitations would hamper his literary future. In 1954, he married an Egyptian woman, with whom he had two daughters. Mahfouz did not shrink from controversy outside of his work. As a consequence of his outspoken support for Sadat's Camp David peace treaty with Israel in 1978, his books were banned in many Arab countries until after he won the Nobel prize. Like many Egyptian writers and intellectuals, Mahfouz was on an Islamic fundamentalist "death list." He defended Salman Rushdie after Ayatollah Ruhollah Khomeini condemned Rushdie to death in 1989, but also criticized his Satanic Verses as "insulting" to Islam. Mahfouz believed in freedom of expression and although he did not personally agree with Rushdie's work, he did not believe that there should be a fatwa condemning him to death for it. He also condemned Khomeini for issuing the fatwa, for he did not believe that the Ayatollah was representing Islam. If only we had behaved in the proper Islamic manner with Naguib Mahfouz, we would not have been assailed by the appearance of Salman Rushdie. Had we killed Naguib Mahfouz, Salman Rushdie would not have appeared. The appearance of The Satanic Verses brought back up the controversy surrounding Mahfouz's Children of Gebelawi. Death threats against Mahfouz followed, including one from the "blind sheikh," Egyptian theologian Omar Abdul-Rahman. Like Rushdie, Mahfouz was given police protection, but in 1994, Islamic extremists almost succeeded in assassinating the 82-year-old novelist by stabbing him in the neck outside his Cairo home. He survived, permanently affected by damage to nerves in his right hand. After the incident Mahfouz was unable to write for more than a few minutes a day and consequently produced fewer and fewer works. Subsequently, he lived under constant bodyguard protection. Finally, in the beginning of 2006, the novel was published in Egypt with a preface written by Ahmad Kamal Aboul-Magd. In July 2006, Mahfouz sustained an injury to his head as a result of a fall. He remained ill until his death on August 30, 2006, in a Cairo hospital. In his old age, Mahfouz became nearly blind, and though he continued to write, he had difficulties in holding a pen or a pencil. He also had to abandon his daily habit of meeting his friends at coffeehouses. Prior to his death, he suffered from a bleeding ulcer, kidney problems, and cardiac failure. Mahfouz was accorded a state funeral with full military honors on August 31, 2006, in Cairo. His funeral took place in the el-Rashdan Mosque in Nasr City on the outskirts of Cairo. Most of Mahfouz's early works were set in el-Gamaleyya. Abath Al-Aqdar (Mockery of the Fates) (1939), Radubis (1943), and Kifah Tibah (The Struggle of Tyba) (1944), were historical novels, written as part of a larger unfulfilled project of 30 novels. Inspired by Sir Walter Scott (1771-1832) Mahfouz planned to cover the whole history of Egypt in a series of books. However, following the third volume, Mahfouz shifted his interest to the present, the psychological impact of the social change on ordinary people. Mahfouz's central work in the 1950s was the Cairo Trilogy, an immense monumental work of 1,500 pages, which the author completed before the July Revolution. The novels were titled with the street names Palace Walk, Palace of Desire, and Sugar Street. Mahfouz set the story in the parts of Cairo where he grew up. They depict the life of the patriarch el-Sayyed Ahmed Abdel Gawad and his family over three generations in Cairo from WW I to the 1950s, when King Farouk I was overthrown. With its rich variety of characters and psychological understanding, the work connected Mahfouz to such authors as Honore de Balzac, Charles Dickens, Leo Tolstoy, and John Galsworthy. 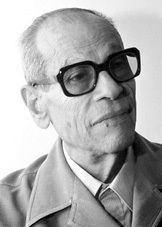 Mahfouz ceased to write for some years after finishing the trilogy. Disappointed in the Nasser régime, which had overthrown the monarchy in 1952, he started publishing again in 1959, now prolifically pouring out novels, short stories, journalism, memoirs, essays, and screenplays. Chitchat on the Nile (1966) is one of his most popular novels. It was later made into a film featuring a cast of top actors during the time of president Anwar al-Sadat. The film/story criticizes the decadence of Egyptian society during the era of Gamal Abdel Nasser. It was banned by Sadat to prevent provocation of Egyptians who still loved former president Nasser. Copies were hard to find prior to the late 1990s. Mahfouz's prose is characterized by the blunt expression of his ideas. He has written works covering a broad range of topics, including socialism, homosexuality, and God. Writing about some of the subjects was prohibited in Egypt. The Children of Gebelawi (1959) (also known as "Children of our Alley") one of Mahfouz's best known works, has been banned in Egypt for alleged blasphemy over its allegorical portrayal of God and the monotheistic Abrahamic faiths of Judaism, Christianity, and Islam. It portrayed the patriarch Gebelaawi and his children, average Egyptians living the lives of Cain and Abel, Moses, Jesus, and Mohammed. Gebelaawi has built a mansion in an oasis in the middle of a barren desert; his estate becomes the scene of a family feud which continues for generations. "Whenever someone is depressed, suffering or humiliated, he points to the mansion at the top of the alley at the end opening out to the desert, and says sadly, 'That is our ancestor's house, we are all his children, and we have a right to his property. Why are we starving? What have we done?'" The book was banned throughout the Arab world, except in the Lebanon. In the 1960s, Mahfouz further developed its theme that humanity is moving further away from God in his existentialist novels. In The Thief and the Dogs (1961), he depicted the fate a Marxist thief, who has been released from prison and plans revenge. Ultimately he is murdered in a cemetery. Mahfouz described the development of his country in the twentieth century. He combined intellectual and cultural influences from East and West—his own exposure to the literature of non-Egyptian culture began in his youth with the enthusiastic consumption of Western detective stories, Russian classics, and such modernist writers as Marcel Proust, Franz Kafka, and James Joyce. Mahfouz's stories, written in the florid classical Arabic, are almost always set in the heavily populated urban quarters of Cairo, where his characters, mostly ordinary people, try cope with the modernization of society and the temptations of Western values. He was greatly disillusioned with the 1952 revolution and by Egypt's humiliating defeat in the 1967 Six day war. He opposed the 1957 revolution not because of its principles, but because he felt that the practices failed to live up to its principles. Mahfouz was one of the first Egyptian writers to explore the theme of existentialism in his writings. Mahfouz was the oldest living Nobel Literature laureate and the third oldest of all time, trailing only Bertrand Russell and Halldor Laxness. At the time of his death, he was the only Arabic-language writer to have won the Nobel Prize for Literature. Most of Mahfouz's writings mainly dealt with politics, a fact which he himself once emphasized: "In all my writings, you will find politics. You may find a story which ignores love or any other subject, but not politics; it is the very axis of our thinking." He greatly espoused Egyptian nationalism in many of his works, and expressed sympathies for the post-World war era Wafd Party. He was also attracted to socialist and democratic ideals early on in his youth. The influence of Socialist ideals is strongly reflected in his first two novels, Al-Khalili and New Cairo, and also in many of his latter works. However, in spite of his firm belief in socialism, Mahfouz was never a Marxist in any sense of the word. In his youth Mahfouz had personally known Sayyid Qutb, author and intellectual associated with the Muslim brotherhood, then showing a greater interest in literary criticism than in Islamic fundamentalism; Qutb later became a significant influence on the Muslim brotherhood. In fact, Qutb was one of the first critics to recognize Mahfouz's talent in the mid-1940s. Mahfouz even visited Qutb when the later was in the hospital, during the 60s, near the end of his life. In his semi-autobiographical novel, Mirrors, he drew a very negative portrait of Sayyid Qutb. ↑ 1.0 1.1 Rasheed El-Enany, Naguib Mahfouz: The Pursuit of Meaning (Routledge, 1992, ISBN 0415073952). ↑ Ilan Pappé, The Modern Middle East (Routledge, 2005, ISBN 0415214092). ↑ Deseret Morning News editorial, The legacy of a laureate. Retrieved November 18, 2008. ↑ Le Monde, March 8, 1989. ↑ Yusu al-`Aquid, "`Al-Wudu` bi-Dima` Najib Mahfouz`" al-`Arab, July 3, 1989. ↑ Haim Gordon, Naguib Mahfouz's Egypt: Existential Themes in His Writings. Retrieved November 18, 2008. ↑ Rasheed El-Enany, Naguib Mahfouz: The Pursuit of Meaning (Routledge, 1992, ISBN 0415073952). El-Enany, Rasheed. Naguib Mahfouz: The Pursuit of Meaning. Routledge, 1992, ISBN 0415073952. Hashmi, Alamgir. The Worlds of Muslim Imagination. Islamabad: Gulmohar, 1986. ISBN 0-00-500407-1. Pappé, Ilan. The Modern Middle East. Routledge, 2005, ISBN 0415214092. This page was last modified on 6 November 2018, at 00:32.